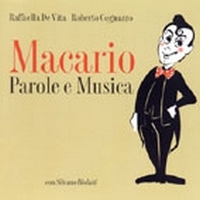 On the centennial of Macario's birth-the great Turin-born artist-, Raffaella De Vita and Roberto Cognazzo realised a CD with which they meant to remember and show this man through music. They selected 20 titles from the great revues and films he acted in between 1938-1954. It's a pretty important chapter in the history book of Italian pop music.